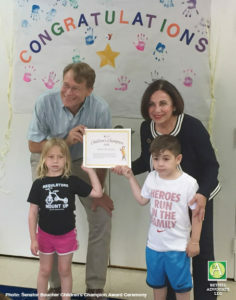 Photo: Connecticut Early Childhood Alliance Executive Director Merrill Gay and children from the Wilton Family YMCA’s Camp to Come to program present Sen. Toni Boucher with the Children’s Champion Award. State Senator Toni Boucher (R-26) was recently named a 2018 Children’s Champion by the Connecticut Early Childhood Alliance (CECA). The award is given to legislators who demonstrate leadership on issues that impact the well-being of Connecticut’s young children in the areas of healthy development, early care and education, nutrition, and safety. Now the Co-Chair of the legislature’s Education Committee, Sen. Boucher began her political career as a member of the Wilton Board of Education. She also has served as a member of the Connecticut State Board of Education. “Each of the legislators we’re recognizing this year stood up for children to protect funding for child care or to push policy change that supports families with children,” said Merrill Gay, Executive Director of the Alliance. Sen. Boucher represents the communities of Bethel, New Canaan, Redding, Ridgefield, Weston, Westport, and Wilton.